On Monday, over 1,700 people tuned into the livestream of Ferguson is the Future, a day-long symposium at Princeton University. Unlike most science fiction/fantasy conferences, this one centered Blackness and social justice. 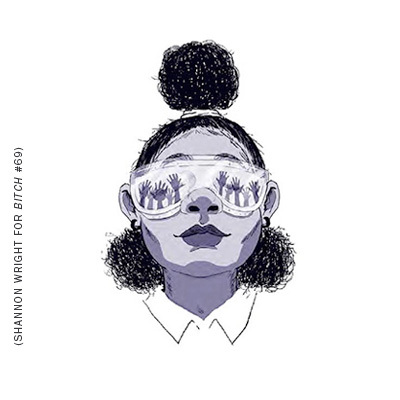 “We need visions of the future, and our people need them more than most,” said speculative fiction author Nalo Hopkinson, quoting sci-fi great Samuel Delany. Throughout the day, scholars such as Dorothy Roberts and Alondra Nelson, science fiction writers like as Nisi Shawl and Tananarive Due, and Ferguson activists like as Johnetta Elzie, DeRay McKesson, and Brittany Packnett explored possible visions of the future. Using arts, political activism and scholarship, they discussed how they're working to transform the world from one brimming with injustices and oppressions to one in which everyone can create and thrive. “I think our obsession with dystopia is our realization of what we've already set in motion,” said adrienne maree brown, co-editor of the social justice science fiction collection Octavia's Brood. Unbeknownst to her, as she was uttering those words, teachers and police at a high school in Texas were proving her point. That same afternoon, fourteen-year-old Ahmed Mohamed, a freshman at MacArthur High School, brought in a digital clock that he had built the night before. The clock, which fit inside a pencil case, was built using a circuit board and power supply wired to a digital display. Mohamed was excited to show his project to his science teacher. But instead of being praised for his ingenuity and encouraged to take advanced science classes, Mohamed instead was handcuffed and taken to a juvenile detention facility. Although the eager student insisted that his creation was a homemade clock, the principal said it looked like a “movie bomb” and called the police, who interrogated Mohamed for nearly an hour and a half. When they were finally convinced that the clock was not a bomb, he was released although the police initially said that they might still charge him with making a hoax bomb. He was also suspended from school for three days. Since Ahmed's arrest—complete with a photo of the bewildered boy in a NASA t-shirt being led out in handcuffs—hit headlines, an outpouring of support has come in over social media under the hashtag #IStandwithAhmed. The outpouring of public outrage and media attention led police to drop any talk of charges against Mohamed. However, his suspension remained in place (and the police have kept his clock). 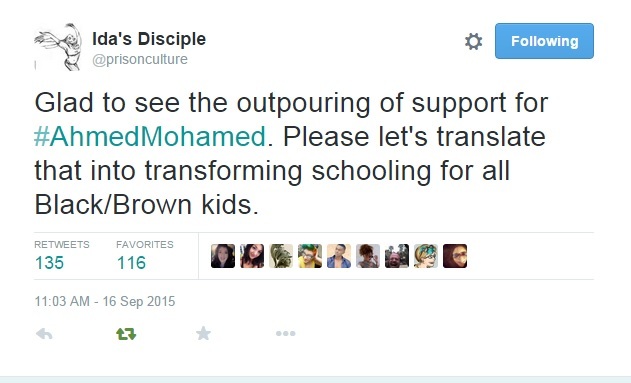 Meanwhile, Twitter and Google have offered Mohamed internships and he appeared on MSNBC, where a physicist from MIT invited him to tour the school. The president invited him to bring his homemade clock to the White House. But arresting students of color for demonstrating an enthusiasm for science is not atypical. In May 2013, Florida high school student Kiera Wilmot's science experiment went awry. Her experiment, a volcano combining aluminum foil and toilet bowl cleaner in a bottle, blew the cap off the bottle and produced smoke. Although no one was hurt and nothing was damaged, she was arrested, charged with creating a chemical explosion on school grounds, and expelled. Oh yeah, Kiera is Black. 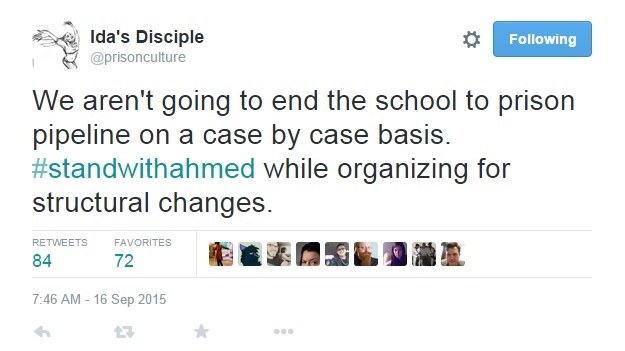 While the arrests of Kiera and Ahmed drew public outcry and media attention, many do not. Project NIA, which works to decrease the number of Chicago youth who are arrested, detained, and incarcerated, found that from 2013 to 2014, there were 39,279 juvenile arrests in the city of Chicago. Of those, 7,703 took place on the property of a Chicago public school; 6,836 took place inside a Chicago public school. Over half of these arrests were of students under the age of sixteen. And, of course, race and racism play a huge role: For every one white child who's arrested, nearly 30 Black children are arrested. Project NIA has been working towards that goal. As part of the Yes to Counselors, No to More Cops in Our Schools Campaign, the group helped produce a video showing how one Chicago school manages school safety without relying on police or police-like policies. Instead, it utilizes peace circles in which students gather to talk out their disagreements. Staff and students alike are trained in non-violent conflict resolution with some teens going on to a more intensive five-day training. Students celebrate the number of days that the school has seen peace and, when they graduate, take this mindset and skillset with them as they journey through the rest of their lives. So, too, have thousands of low-income Black and Latino parents working with COFI (Community Organizing and Family Issues) to change punitive Chicago school policies. As Monday's arrest of Ahmed Mohamed—and the arrests of children that don’t make the news—demonstrates, there's still a lot of work to do to build that dream world. 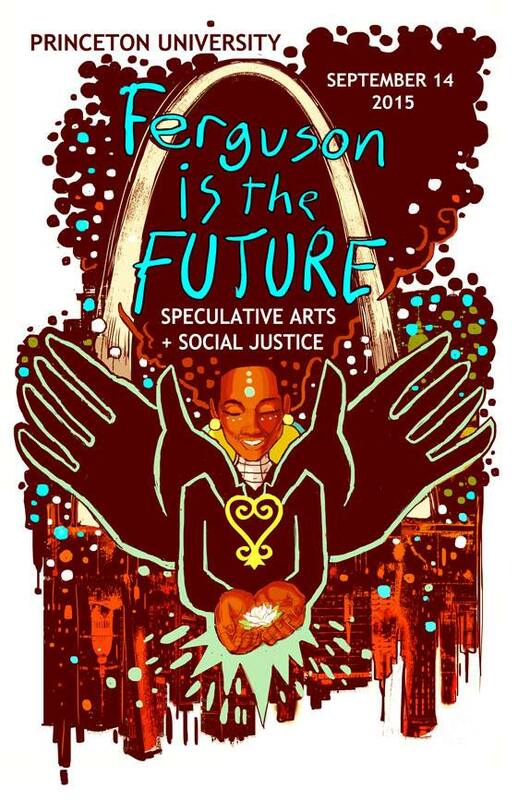 But, as Ferguson is the Future reminded the audience in the room, all organizing is science fiction—that doesn't mean its goals are impossible. The absence of Black mommy memoirs mirrors the relative absence of Black women’s voices in mainstream U.S. media discourse about motherhood in general.